I love salads with oranges! I’d never had one until I started exploring the food of North Africa. Once my antenna were up, I saw that many cultures use oranges in salads. 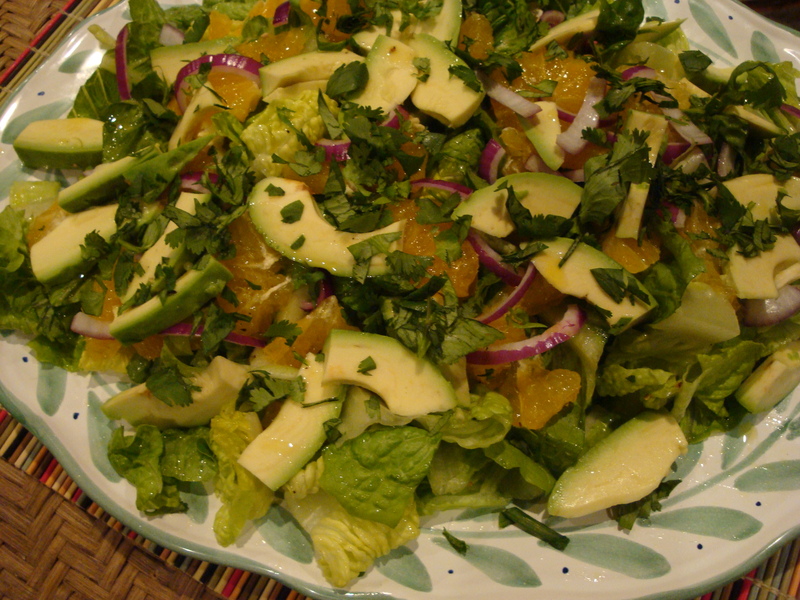 This is the first salad with oranges that I made, and I go back to it over and over. It is especially good with rich Moroccan stews and tagines. This recipe makes enough for six people but is also flexible. So vary the quantities according to number of people and your tastes. Whisk all ingredients together and set aside. Note: Juice will be expelled when you prepare the oranges. I always just use that juice, whether it adds up to 2 tablespoons or not. Prepare the oranges by cutting off the top and bottom. 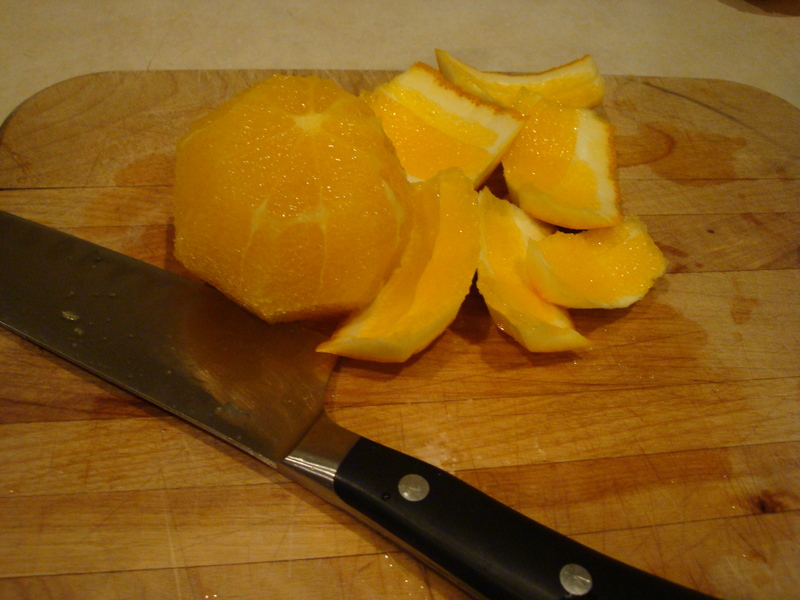 Use a knife to cut off the rind (vs. peel with your hands), including the white pith. This is key to making sure the oranges are not bitter. Cut oranges in ¼ inch slices, then cut those in half. Slice the red onion, then cut into half-moons. Cut the olives in half. Cut the mint leaves into thin ribbons. Tear the lettuce into medium pieces; wash and dry. Arrange the oranges in overlapping slices on top of the lettuce. 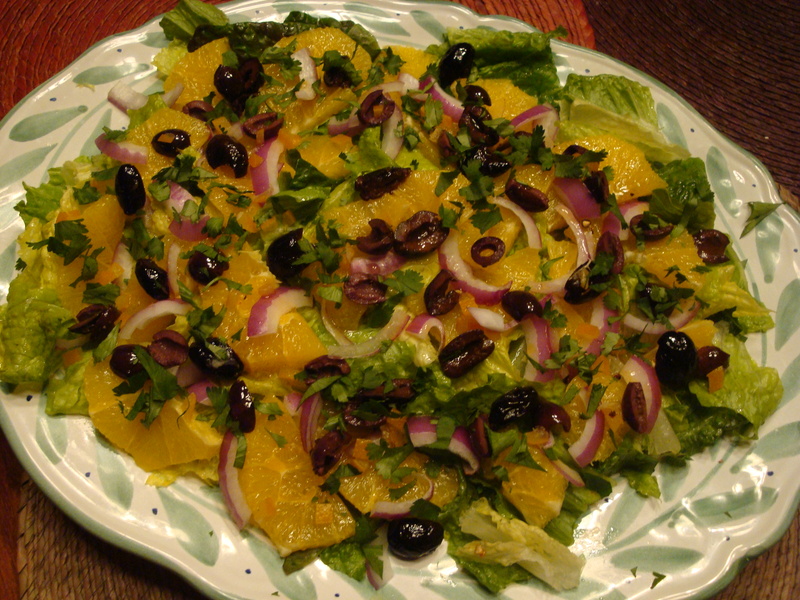 Place the onion, preserved lemon and olives on top of the oranges. Drizzle all with the remainder of the dressing. Sprinkle the mint or cilantro on top and serve. Alternatively, toss all the ingredients – oranges through mint or cilantro- together with the remaining dressing and place on top of the lettuce. Note: the lettuce is my addition. Authentic North African salads of this type do not include it, but I think it adds great texture and flavor. If you do not use lettuce, increase all other ingredients except the dressing. 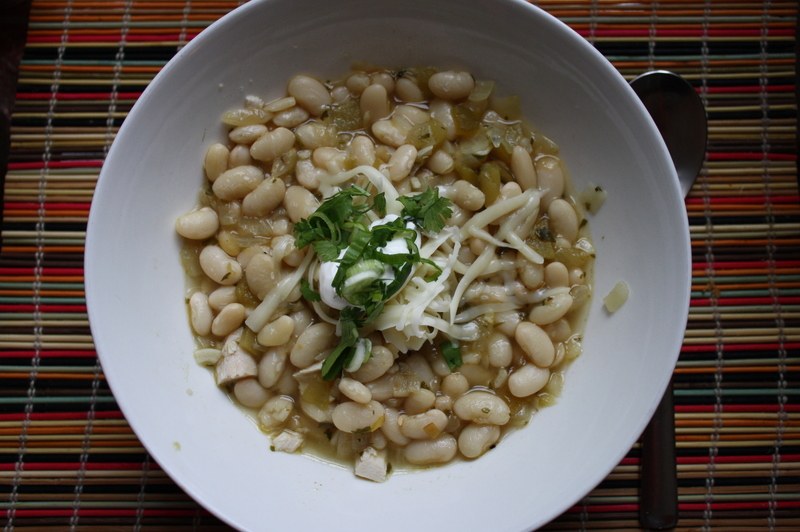 White Chili – delicious but not widely known! When I moved to Minnesota from the San Francisco Bay area years ago, my co-workers threw me a going away party. They were instructed to bring a gift that would either remind me of California or prepare me for Minnesota. One of the gifts was a box of white food designed to introduce me to the cuisine of Minnesota – things like marshmallow fluff, mayonnaise, white rice, etc. This was a hoot, but I didn’t think much further about it until my first week in Minnesota when I found myself in a Lund’s restaurant on a chilly day with my new Minnesota co-workers. I saw chili on the menu and thought it sounded perfect. When I ordered it, the server asked me if I wanted the white chili or the red chili – white chili? Of course, I had to order the white given my white food gift and I loved it! I had never heard of white chili before, but I knew I had arrived in Minnesota. This is an adaptation of the dish I first had 17 years ago! Cooks Notes: This recipe calls for chicken or turkey broth and chicken or turkey meat. It is easily made meatless or vegetarian by substituting mock chicken broth powder+water for the broth and omitting the meat. 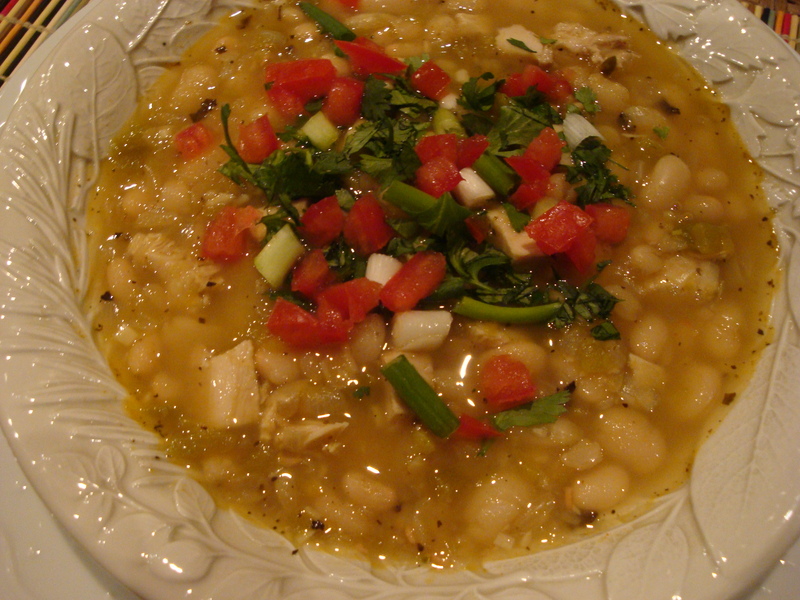 I almost always make this with canned beans, using a combination of great northern and cannellini. Today, I decided to start with dried beans, same combination. What a delightful difference in flavor – but then it takes extra time. Either way, this freezes well so make a bunch! Put dried beans in a pot and cover with 3 inches of filtered water. Bring to a boil, turn off heat and let sit for 45 minutes. Drain the beans and then put them in a large soup pot or dutch oven. Add the broth – more or less depending on how thick you want the chili. Bring to a boil, reduce heat and simmer for 45 minutes to 1 hour until beans are cooked, but not mushy. Set the pot aside while you make the chili base. Coat a saute or frying pan with the vegetable oil. Bring to medium-high heat and add the onions. Saute, stirring , for 5-8 minutes until soft and starting to brown. (Turn down the heat to medium after about 2 minutes) Add the garlic and saute 1 minute, then add the cumin, oregano and cayenne pepper and saute 1 more minute. Add the diced green chiles and saute for 2 more minutes. Add this mixture to the pot of white beans/broth. Put the pot back on the burner, bring to a boil, turn down heat and simmer for 30 minutes. If the chili is soupier than you want, you can simmer with the lid off for part of all of the 30 minutes to thicken and concentrate the flavors. Otherwise, simmer covered. IF USING CANNED BEANS: Follow the saute instructions, but in a soup pot or dutch oven. Add the broth and canned beans, bring to a boil and simmer for 30 minutes. When ready to serve, add the chicken or turkey meat. Stir and heat until serving temperature, but don’t bring to a boil again. Ladle into bowls. Place the garnishes on the table so people can add the things they want to their individual bowls. Serve with Orange and Avocado Salad and Harvey Cornbread. Chop 1 head romaine lettuce. Make a dressing of olive oil, lime juice, salt and pepper. Toss with the lettuce, then place on a platter. Peel 2 oranges with a knife, cutting off all rind and pith. Slice and cut each slice into quarters. Arrange over the lettuce. Place 3 slices of red onion cut into half moons and one sliced avocado on top of the lettuce. Drizzle with a little more dressing. Garnish with chopped cilantro.